Do you want to save trees and rainforests? Recycling paper is a vital part of keeping the environment free of pollution and keeping our forests lush and green. This won’t only help keep the planet safe for future generations. Recycling paper will save the forests you can enjoy today! Do you like hiking in the mountains and in the woods? Then be sure to recycle used paper, magazines, and newspaper. Do you enjoy camping outdoors in the summertime? Then don’t forget to recycle when you’re hanging out at home. It’ll keep those outdoors beautiful and filled with tall trees. A 2014 report from the US Environmental Protection Agency (EPA) shows that paper and paperboard accounts for 26 percent of all municipal solid waste generated in the United States. This has decreased by 3 percent from 2010. However, it is still a major part of landfill material. Americans are doing better at recycling paper but we need to push forward and recycle even more paper products. Lots of paper is still filling up landfills all over the country. Recycling is a major industry in this nation, which is why there are many recycling centers found all over including near your neighborhood! If you want to take part in this industry, you don’t have to open up your own paper recycling center. You can make a good amount of money recycling paper and cardboard found in your own home and your neighborhood. If you can get plenty of paper accumulated, you’ll find that you can make plenty of money on the side. All you’ll have to do is collect plenty of paper around your neighborhood and bring it to your nearby recycling center. Then you’ll get paid a nice amount of cash. Would you like to get started in this industry? Do you want to earn some money from recycling paper? Will You Get Money for Paper Recycling? I’m sure you want to make money for recycling paper, but you may wonder if paper recycling will actually get you paid a decent wage. It may not be all that simple for you to make lots of money from selling paper products. For example, recycled paper sells on average 75 dollars per ton. For just one household, you may not see much benefit in selling paper. You should still do so in order to save the environment, but it won’t get you nearly as much money as you’d like. As such, you will need to recycle paper on a much larger scale if you’re looking to make a decent profit from this endeavour. You’ll need to work hard to make this into a viable business for yourself. In order to be profitable when recycling paper products, try following the steps below. The first thing you’ll need to do is find some local recycling centers. You can check online and look through a phone book. That will give you a list of different recycling centers in your general location. Give these recycling centers a call to find out how much they pay for paper recycling. Be sure to ask for their prices among different types of paper and cardboard. There are multiple ways to find paper recycling centers. As mentioned previously, looking through phone books is a great strategy. By referring to a phone book, you’ll find the closest recycling center near you. Additionally, you can go to the website Earth911.com to find the location of nearby paper recycling centers. You’ll also learn how paper is recycled through this website. The site offers lots of information about how to help protect the environment and reduce pollution around the planet. You can start collecting paper. Let’s start with any miscellaneous papers, cardboard boxes, magazines, and newspapers. This will benefit you financially as well as give you a way to contribute toward protecting the environment. Ask your neighbors if you can collect old, used papers from them. Nearly everyone gets extra newspapers in the mail they never use. So be sure to ask around! Friends, family, and neighbors likely have extra paper and cardboard they need to get rid of. Be sure to talk to them and get their paper products for extra recycling income! You can even send some fliers around your neighborhood telling neighbors to leave their newspaper and cardboard at a bin in a convenient location. Ask your neighbors if there’s a particular day, possibly on the weekend, when you can come pick up some paper products. You can make a schedule that works for your neighbors and friends. This is especially great in a neighborhood that doesn’t have a simple and straightforward way to recycle paper. Some areas don’t have recycling trucks so you can be the next best thing. You’ll find that your neighbors will be happy to get rid of their cardboard and paper. Another great idea when it comes to collecting paper, magazines, and cardboard is to call up some local businesses. There are plenty of small offices and companies that have old and used paper. Be sure to call up these offices to see if you can pop over once a week to collect their paper for recycling. You’ll find that many businesses would prefer to recycle that paper through your program instead of throwing out used flyers, cardboard or newspapers. Many offices order products like computers, hardware, staplers, notebooks, pencils and pens. All of these office supplies are delivered in cardboard boxes. These businesses tend to throw out the extra cardboard boxes. But they’d be happy to recycle the boxes through your program instead! You’ll help them get these materials off their hands. Additionally, local grocery stores, restaurants or coffee shops often have extra cardboard boxes after having their food delivered. Call up these places too! You’ll find that grocery stores, liquor stores and restaurants have large numbers of cardboard boxes for recycling. So talk to the managers at these stores to find out when you might be able to pick up their miscellaneous cardboard boxes. There’s a wide amount of different paper products you can collect. Be sure to collect newspapers, old phone books, and used scrap paper along with the cardboard boxes from different businesses. Once you have your stash of paper products, be sure to sort and organize each type into different groups of paper. Then you can take your stash of paper to the nearby recycling center and you’ll be able to collect a good wad of cash. After you have collected a huge amount of different types of paper, you’ll need to sort and organize your collection into the different groups such as magazines, phone books, cardboard, flyers or scrap paper, and newspapers. You may need to find a large storage area. When you start sorting and organizing your paper, you’ll need plenty of space. Consider using your garage or possibly your basement to sort out the different types of paper products. Be sure to collect lots of different paper types. That will help you get the highest price when you go to the paper recycling center. The final step after collecting and sorting your paper products is to take them to the local paper recycling center. You can make a good amount of cash to add to your wallet. You’ll find plenty of paper recycling centers around. It’s unlikely that such centers will be missing in your region. Once you get there and recycle all your paper products, you’ll get paid in cash. You’ll be able to make anywhere from $50 to $75 per ton of paper you recycle. 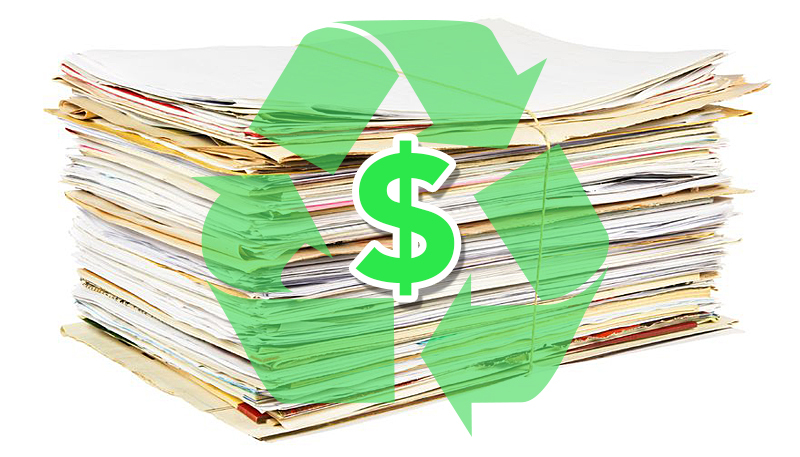 Did You Ever Get Money for Paper Recycling? In conclusion, you will definitely need plenty of paper in order to make a good price recycling such a product. While paper is recyclable, it is a very light material and won’t fetch you as much money as aluminum cans or glass bottles. Remember that you’ll need to get lots and lots of paper products such as magazines and newspapers to make a decent return on your investment. Now I’d love to hear from you and find out what type of recycling projects you’ve done in the past. Did you ever get paid for recycling various materials? Have you ever recycled paper at a recycling center? Have you collected a ton of paper to make some extra money? Want to Help Sandy Hook Victims?